Out of the three cakes that we had, I made two of them. My hubby came home on Friday with a cake he bought from Bengawan Solo for Mother's Day. I was too quick to add that there wasn't enough space in the fridge as I'll be making two cakes-one for my mum, and the other for my mother-in-law. Suddenly, I realised how ungrateful I was! He was kind enough to buy a mother's day cake for me and there I was complaining about the fridge space! After I realised what I have done, I quickly asked what cake did he get for me. He said it was a chocolate cake. The children were more excited than me. Before we could take a picture of the cake, each of them have already eaten the chocolate decorations! 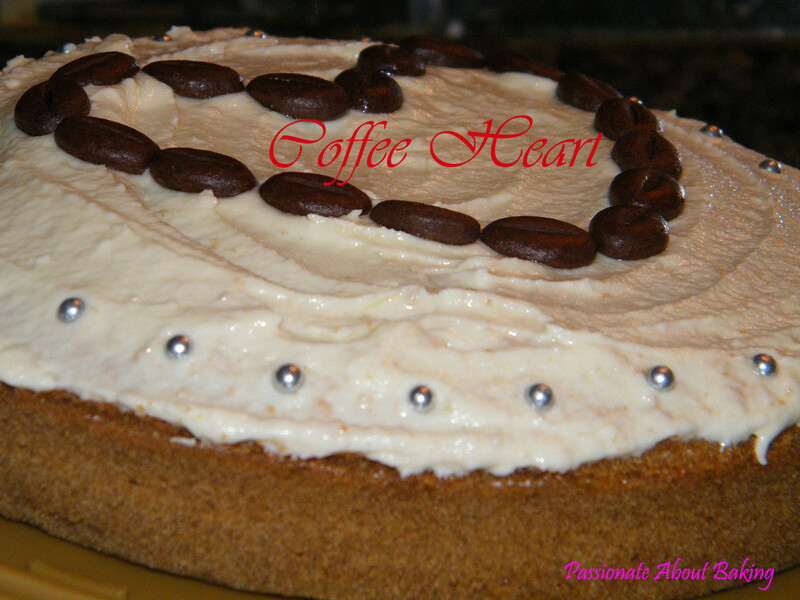 It was a chocolate cake decorated with chocolate pearls. Very nice indeed! Now back to my cakes. 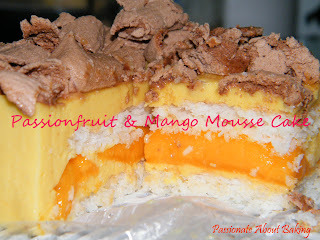 I had wanted to make the Passionfruit and Mango Mousse Cake since I learnt it from a workshop some time back. I followed the recipe carefully and I thought it was really close to the cake I tried last time! This was made for my mum and my family. I thought the cake was pretty well done, except for the mango centrepiece. I couldn't handle the mango well, so the centrepiece was quite horrible! 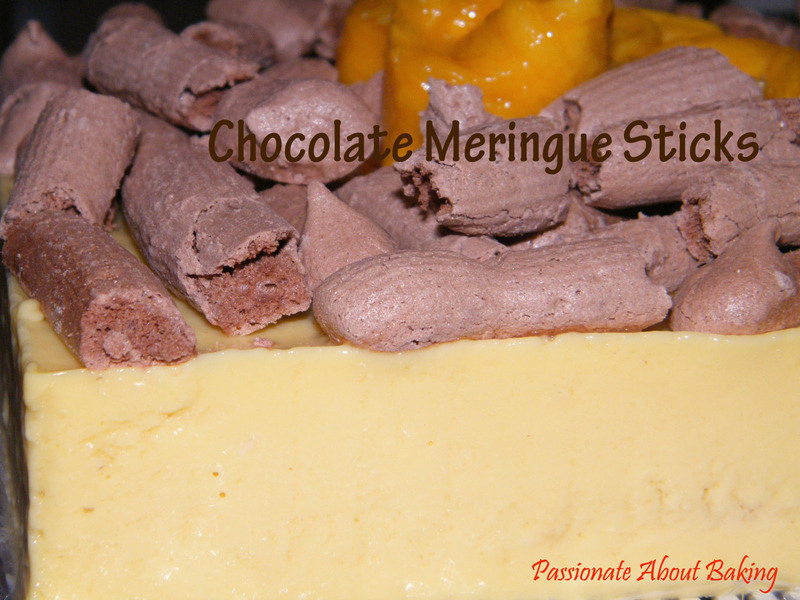 The sweetness of the chocolate meringue sticks complement the sourness of the passionfruit really well! 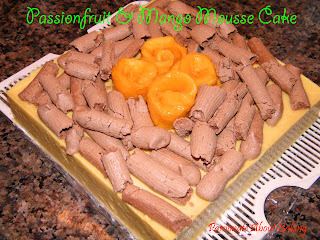 The coconut dacquoise goes really well with the passionfruit and mango mousse. 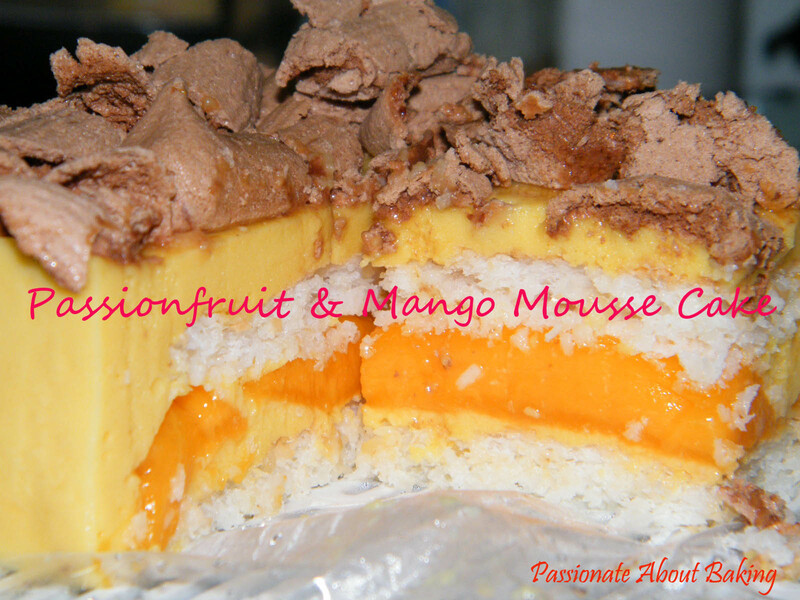 I sandwiched the mousse with mango. My family liked it very much. As for my mother-in-law, I made a coffee cake from Nasi Lemak Lover on Saturday, and had it frosted on Sunday morning. 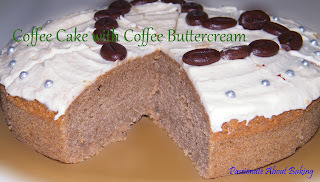 I had to bake it earlier as I had to attend a workshop on Sunday. I thought she might like this cake. I was rather surprised when the cake turned out to be quite flat. From her blog, it looks rather high and big, I couldn't achieve the same. I almost wanted to redo the cake. After discussing with Grace, I decided to proceed with the frosting of the cake the following day. 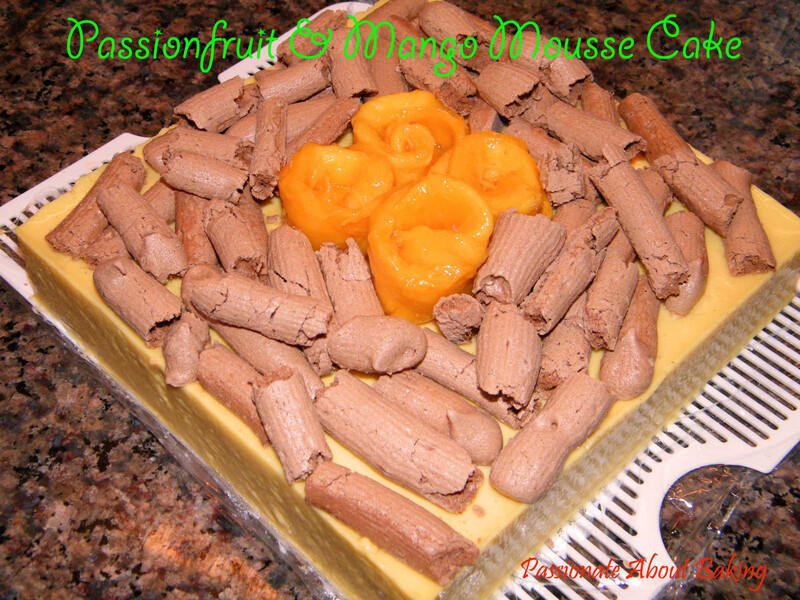 WOW...very special mango mousse. 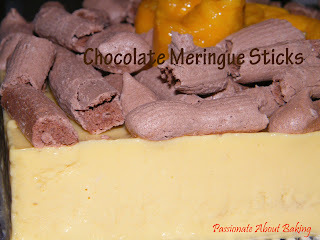 I want a try..hee hee..;p Yummy!! I would be extremely nervous unmoulding that mousse cake, Jane!!! It looks so fragile and you did a perfect job! 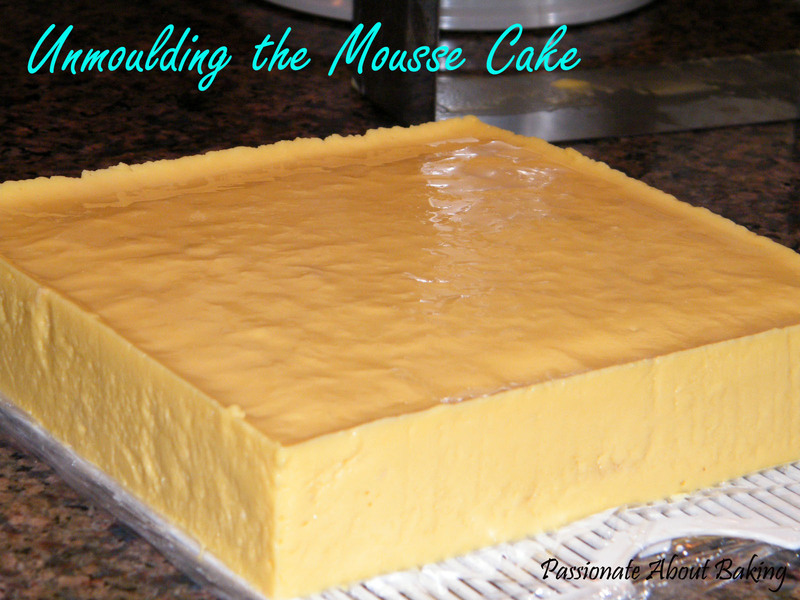 The mousse cake is so so so beautifully unmoulded. 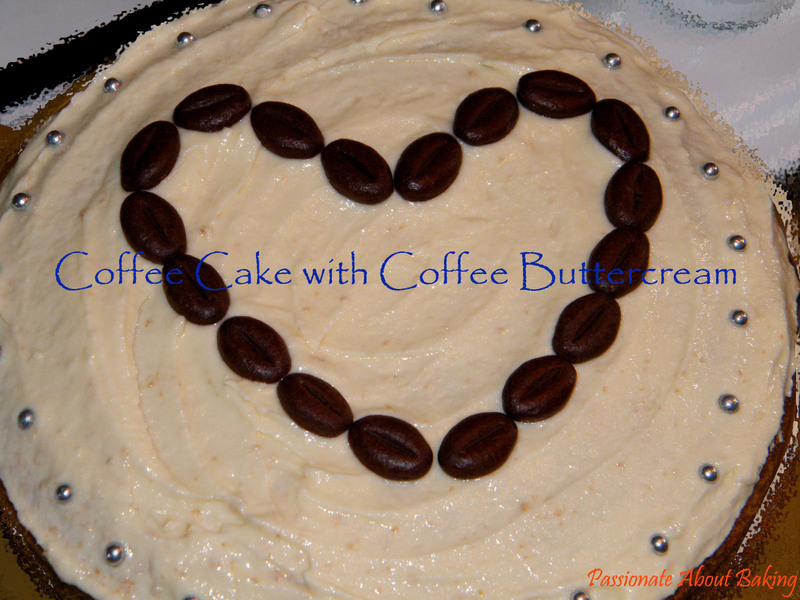 Too bad you picked this from a baking lesson else I would have asked you to share this gorgeous masterpiece recipe for Aaron's birthday end of this month. Ya, I'm so glad you are so understanding. Wish I could share the recipe too! However, I'm sure you can do some modification to other mousse cakes you find on some food blogs, ya?